Auburn Village offers respiratory care for individuals who are dealing with the effects of lung disease and other chronic respiratory problems. Respiratory care focuses on helping you breathe easier by treating respiratory diseases such as asthma, bronchitis, pneumonia, emphysema and chronic obstructive pulmonary disease (COPD). 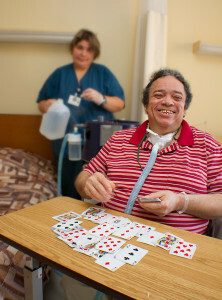 Tracheostomy care is provided to residents and patients with severe lung disorders, neurological problems or infections, who are dependent on a surgically inserted tube (trach) for breathing. Why Choose Auburn Village for Respiratory Care?